BOO! Time to Step Into Your Greatness! | Choose Your Energy: Change Your Life! 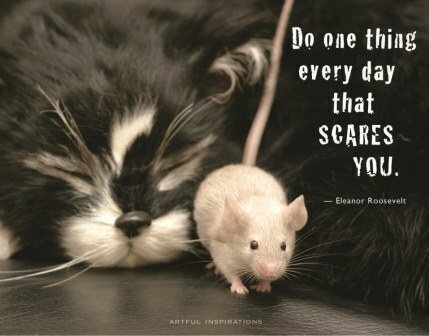 Facing your fears can be beneficial! During my recovery from burnout, I discovered that recognizing, respecting, exploring, embracing and feeling my fears was an essential step in helping me restore wholeness by becoming better at loving myself unconditionally. My first big realization on the road to recovery was that my utter and complete burnout was clear evidence that I had not been loving myself. I was not nurturing, encouraging, or delighting myself in healthy ways physically, mentally, emotionally, or spiritually. I was disrespecting my body, mind, feelings, and values. Working myself nearly to death with no regard for illness or despair. If I had treated another being that way, human or feline, I would have been jailed long ago. When I became serious about uncovering the roots of my imbalance and trying to set it right, I concluded that there are two fundamental types of core energy: love and fear. When I examined the primary energy underneath any thought, feeling, word, or deed, I found love, fear, or some combination of the two. Love is constructive and moves you forward. Fear is destructive and holds you back. Love is the author of truth and reality. Fear is the author of lies and illusion. At first, I didn’t always recognize them as love or fear because they didn’t always show up in my life with those specific labels. I found the terms to be nebulous, tricky, and easy to misunderstand. With awareness, persistence, and unflinching honesty, over time I was able to recognize love and fear masquerading under lots of other masks. In trying to get a more concrete grasp on what healthy self-love might look like, I realized I understood its opposite, fear, much better because I had fueled myself with it for so long. With mindfulness and curiosity, I recognized that the many faces of fear could be synthesized into a four-part pattern that captured the most common guises in which fear showed up in my relationship with myself—contempt, judging, shame, and lack. I then employed one of my favorite writing technologies, the Microsoft Word thesaurus function, to find their opposites—respect, curiosity, compassion, and gratitude. The chart below is my summary of the many faces of love and fear. While taking good care of myself physically produced many healthy changes, when I shifted from taking good care of myself to falling in love with myself, everything else in my life finally fell into place. I lost weight physically, mentally, emotionally, and spiritually. I got off the hamster wheel, found my calling, and created a joyous, fulfilling life. Falling in love with myself was just like falling in love with someone else. I paid attention and treated myself as if I mattered, as if I were my own beloved child. One of the most powerful changes was being relentless about noticing and transforming any negative head talk into more loving, supportive messages. In chapter 6 of my book, Choose Your Energy: Change Your Life!, concerning your personal board of directors, I dive deeply into the roots, role, and transformation of this type of self-sabotaging gremlin head chatter. For now, just know that fear is incredibly toxic; it doesn’t take much to poison the well of your life. Little things like the verbs I use—have to, should, need to, can’t, and the like—are indicators that fear is fueling my thoughts and beliefs about a given situation or relationship. Nothing is too small to matter; every little bit of fear you transform into love gives you a substantial energetic boost. It doesn’t take much fear to bring you down. Letting go of even a little will raise you up. Almost every day, we encounter something that scares us—something that makes our heart race and our palms sweat. This is especially true when we are committed to learning and growth. Being “courageous” isn’t about never being afraid. It’s about being bold enough to face what scares you, and keep going. How often do we stop when we come up against something that pushes us out of our comfort zone? While that reaction is common, it’s one that we benefit from overcoming, if we want to grow continually and be fully alive. While it’s easy to stick with what feels familiar and comfortable, we only grow when we stretch. The more we cultivate the habit of embracing our fears, the more they lose their power and the stronger we become. Remember, it’s not about “never being afraid.” It’s about not letting your fears hold you back. As a board-certified professional life coach, I know from experience the benefits of focusing on the negative. No, that’s not a typo. I did mean focusing on the negative. Rushing a client to reframe a painful thought or feeling in a more positive light, before allowing them to feel and release their pain fully (yes, whatever your gender, there is crying in coaching), robs them of truly robust and lasting benefits of any constructive perspective shift they may attempt. To really overcome our fears, we must first recognize, respect, explore, embrace and feel them. When we do so, the constructive affirmations and more positive outlook we then employ will offer sustained benefits as opposed to merely “putting lipstick on a pig.” This was one of the most beneficial reminders I gained from tapping—slowing down any eagerness to shift too quickly to the positive, so that I allowed time to truly experience and release the negative (rather than glossing over it with denial and empty platitudes). So often we try to think non-stop positive thoughts without first fully accepting our negative emotions or limiting beliefs. By doing this, we increase our internal conflict and exhaust ourselves. With tapping, you first admit the destructive thoughts that have been weighing you down so that you can release them to make room for more constructive affirmations to take root. Concerning this aspect of tapping, Louise Hay observes, “If you wish to clean a house, you must start by seeing the dirt.” Adding fresh flowers and pretty pictures has greater impact when you first eliminate the mess and grime. This way of invoking the law of attraction and positive focus is much more effective than simply living in a fantasy of denial. Freak yourself out by exploring your greatest fears with love, respect, curiosity, compassion and gratitude! Tackle one today, another tomorrow and another the day after that. Before long, you’ll notice that fewer things scare you and more things excite you! Free your self-imprisoned splendor. Let your heart soar and your spirit shine. BOO! Time to step into your greatness! PS: Yesterday I practiced what I teach by conquering another of my own fears. Having moved recently from Colorado to Virginia, my husband and I managed to register both of our cars and get drivers licenses with the help of awesome Newport News, Virginia DMV clerk Michelle Jefferson. We are so grateful for Michelle’s skill and patience. During the hour we spent together we did a lot more laughing than you’d expect at the DMV. Demonstrating once again that everything really is an opportunity to open your heart even wider to find greater love and joy. Bless you Michelle! This entry was posted in All My Blog Posts, Curiosity, Respect & Compassion, Falling in Love With Yourself, Love, Fear & Gremlins and tagged Deborah Jane Wells, From fear to love, How to love myself, How to love yourself, Love or fear, What is compassion, What is curiosity, What is fear, What is respect, What is self-love. Bookmark the permalink.